No. 8 Sam Schindler spikes the ball after senior Adam Brewster (5) sets the ball during a match at Hyland Arena on March 2019. 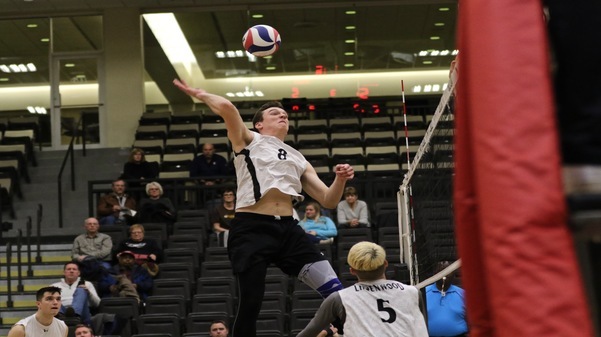 The Lindenwood men’s volleyball team defeated Ball State in five sets but fell short to Purdue Fort Wayne for their last home matches at Hyland Arena. It is the first time the Lions defeated a nationally ranked team this season since April 5, 2017, when they beat no. 8 Loyola Chicago. The Lions took their match against Ball State to five sets on Friday night. After a slow start on the first set for a 25-18, the Lions came back strong on the second set with four kills in a row to win the match 20-25. On the third set, the Lions and the Cardinals exchanged points at the beginning but four attack errors by the Cardinals helped the Lions boost past them to win 16-25. The fourth set was a closer match, and the Lions lost merely by two points for a 25-23 score. On the fifth and decisive set, the teams were close throughout the entire set, but the Lions ultimately took the win 15-11. According to the Lindenwood Lions website, senior middle hitter Connor Hipelius led the Lions with 16 kills and a .542 attack percentage, this being the fourth time this season to hit above .500 with over 15 attacks. Nick Stevenson recorded his first double-double of the season with 12 kills and 19 digs. On Saturday night, the Lions had a pre-match ceremony to honor seniors Adam Brewster, Hipelius and Ben Symonds. The Lions would then take on nationally ranked team Purdue Fort Wayne and took the match to five sets once again for the second consecutive match. On the first set, the Lions started strong and kept the intensity for the remainder of the set. With one kill by Diego Negrón and one attack error by the Mastodons, the Lions took the win with a 33-31 score. The second and third set were different as the Lions struggled to string points, losing 25-17 and 25-16 respectively. However the Lions powered through the fourth set and maintained a fairly good advantage against the Mastodons to win the set 22-25. The Mastodons ultimately took the win on the fifth set 15-11 by stringing six points in a row. Alex Pappas led the match with eight blocks and posted a .462 attack percentage. Negrón had his career-best 22 kills and a .349 attack percentage. Brewster had 50 assists.